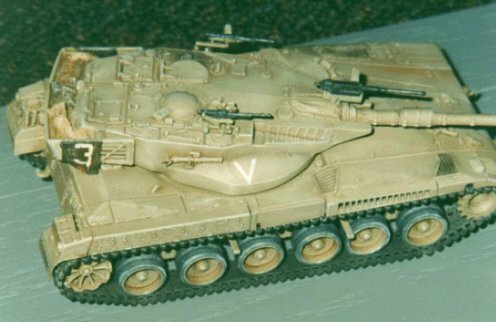 One of the first ESCI kits I built, the Merkava was an excellent introduction to the brand. The amount of detail included on this model is overwhelming. Much of it is molded onto the hull, with some small, additional details to be glued on. There's really not a whole lot more I can say about the details, just look at the photo above, and judge for yourself. I did no scratch building here. Only the tank commander's hatch is molded open; the loader's and Driver's hatches are molded shut. The 7.62mm driver's and loader's MG's are pretty decent, but what really shines is the .50cal remote MG above the cannon. I've made a mold of this MG so I can use reproductions for other kits that require a .50cal. It is superb. The main gun is fixed and does not elevate. The suspension is also very well detailed. But unfortunately, ESCI once again chose to mold each pair of bogie wheels as a single, double wide wheel. I HATE THAT! There is absolutely NO reason for taking shortcuts like that. Aside from that glaring error, the wheel hubs are very detailed, and the tracks are hard plastic, link and length style, and have excellent detail on the outside surface, but the inner surface is smooth. The kit includes side skirts, which are not shown on the above vehicle. I found that the tracks stick out a little too far, and the edges of the track links would have to be sanded down some to get the side skirts to fit. Perhaps with the skirts on, the stupid wheel design would not be as noticeable. I sanded grooves down the center of each double-wide bogie wheel to give the appearance of a pair of wheels. I added some bed rolls and other stowage inside the bustle rack on the turret rear, and made some numbered flags to hang off the sides of the rack. These flags were used in tactical exercises. I painted the model in a desert tan color (I forget which one), but it is incorrect; the Israelis use a unique greenish-tan color. XtraColor produces this color, called Israeli Tank Sand Grey (X810) (thanks Harald). I'm not sure who else makes it. 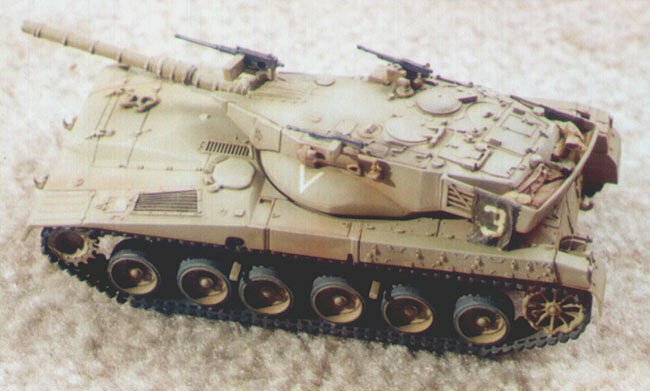 ESCI also makes a Merkava II kit, which is identical to this kit, but with the inclusion of additional turret armor. Hopefully, I will soon have a review of that kit as well.